The impulse to sort and classify William J. O’Brien’s 100 vessels, urns, plates, masks, heads, fragments and geometric constructions in his current exhibition should be suppressed, at least momentarily, for the power of this display is in its collective glut, as a chorus of many shouting, horrible and sick faces and visceral sculptures, raw or glazed, in densely textured and richly colored patinas. After this exhibition, the 100 sculptures will be removed to their respective homes and propped onto shelves or pedestals like the good trophies that they are, but for now, these goblins of taste are presented buffet-style like the feast of some pagan ceremony. 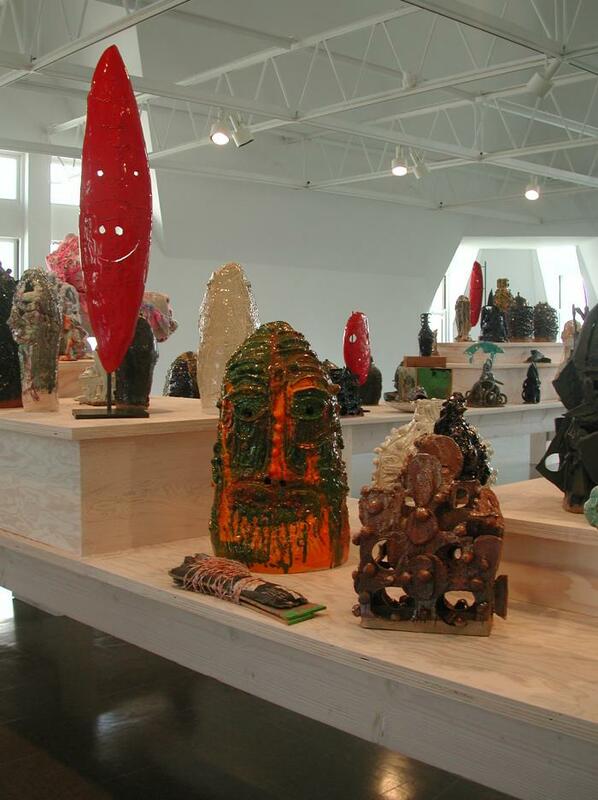 The mostly ceramic sculptures tickle the line between natural-history-museum artifacts and Tiki mug souvenirs, not as a critique of ethnographic cultural consumerism and exoticism but as a way for O’Brien to articulate a spectrum of symbols on the cusp of original feeling and mainstream sentiment, like a parade organized by James Ensor. The crowd of objects expresses a dynamic psychology: there are things buried and prematurely unearthed; there are freshly bundled and hoarded piles of waste; there are plenty of finger-sized orifices. Most importantly, the urns, vessels, heads and totems burn with internal tension, reliquaries of ashen and neutered desire. Like Freud’s tchotchke shelf, some things seem grotesque because they are so familiar.